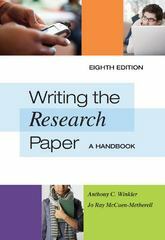 Writing the Research Paper 8 Edition Get simple, specific guidance on writing a research paper with WRITING THE RESEARCH PAPER: A HANDBOOK, Eighth Edition. With its easy-to-digest steps that demystify the writing process, this accessible handbook gives you the tools you need to work independently to create well-constructed research papers-throughout your college career and beyond. Within the text, you'll discover comprehensive, up-to-date information conveyed in a calm and reassuring manner that encourages you to turn to any section of the text at any time for immediate, expert assistance. Each self-contained section is as brief as possible so you won't need to wade through extraneous material-and can be effectively used in any order, depending on your needs.